EPDM Access door weatherstripping is widely used in the HVAC industry to seal duct access doors against light, dust, moisture and other weather related elements. Our EPT series weatherstripping is supplied with a convenient release liner that allows for easy peel-and-stick installation. Remove the weather seal tape from its liner and administer pressure to apply. Access door weatherstripping can be cut to width to fit any size requirement. 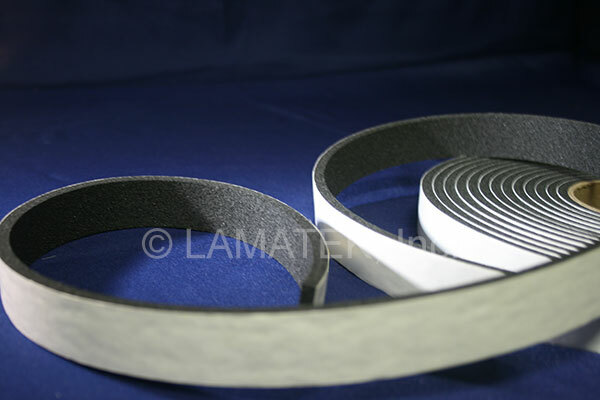 Access door weatherstripping tape is supplied in rolls on a sturdy cardboard core tube. EPDM is a closed cell rubber sponge with excellent compression recovery and exemplary acid, alkali, ozone and oxidation resistance. LAMATEK’s EPT series foam passes MIL-R-6130C and FMVSS-302 testing for flammability. Access door weatherstripping employs an aggressive rubber based adhesive for a strong reliable bond. Unlike neoprene sponge, EPDM offers excellent compression recovery making it an ideal product for access door applications where the seal will be opened and closed repeatedly. Contact us today for technical information, samples and to request a quote.